We present an easy-to-build — and good-sounding — upsampling digital-to-analog converter. 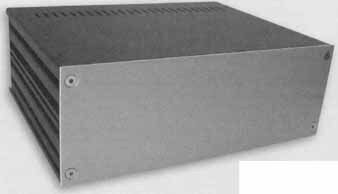 I had wanted to build a DAC for a long time, but other audio duties kept me from doing so. After some on-line searches, I was able to find many do-it-yourself kits, as well as some assembled DACs (mainly from Asian sellers) at such cheap prices that I was tempted to give them a try. However, soldering and building DIY projects acts as a kind of meditation for me, recharging my mind. So, I definitely wanted to assemble a DAC rather than buy a ready-to-play one. I first needed to decide between upsampling or plain oversampling topology. Some audiophiles believe upsampling is the wrong way to go, but in the end, it is a philosophical decision. Anyway, I chose upsampling. My next question was: Which DAC chip to employ? I had the chance to listen to the Accuphase DPS7 CD player, which I liked very much and which uses the TI PCM1796 (ti.com), so I decided on either this family of chips or the AD1853 (analog.com), which is used in another Accuphase player. Both those Analog Devices and Texas Instruments DACs have differential current output, leaving full freedom in choosing the current to voltage conversion (I/V) circuit. After much web surfing, I ended up with two DAC options: the Analog Devices 1853 evaluation board (now replaced by the EB1955), which, at the time, came at a cheap price. The second option was to buy the ezDAC PCB by Evan Zamir. Because I wanted to gain some experience with SMD components soldering and to be free to choose the components to be used, I decided on the ezDAC (Photo 1). Evan is a professor of mechanical engineering at Georgia Tech University, but most of all he is a DIY audio enthusiast who decided to produce a small number of PCBs just for fun and passion, without any commercial gain. So I contacted him and ordered the PCB, plus some spare components. I waited a long time to receive the box, due to postal delay, but when it finally arrived I was impressed by the quality of the board. You can find more information on Evan’s website . The PCB I used is version 1.0, al though the upgraded v. 1.5 is available. These boards are similar, with the newer one including some jumper-able power rails (which allow easier modifications to the regulator section) and the addition of solder mask-silkscreen layers. The ezDAC architecture is shown in Fig. 1. The S/PDIF digital input enters a 1:1 pulse transformer, which offers some galvanic isolation to the noise present in the input signal. The quality of the transformer is very important here. The DIY audio community recommends the used model: the Newava S22083 alias Schott 22083. Making a good pulse transformer is an art, because some compromises exist; one parameter that has a big impact on the performance is the leakage inductance, the lower the better. Because the Newava is hard to find in Europe, while US DIYers can find it at Digi-Key, I investigated some possible substitutes, finding the Umec UT14013 and the C&D 76601/3 as valid candidates, though with different PIN dispositions. I tried to buy them from a local distributor and reseller, with no success. So I e-mailed the manufacturers asking for a sample, explaining to them my project and a follow-up article, but getting the same result: zero. So, unfortunately, I can’t provide a pulse transformer comparison. Last minute note: While writing this article, I checked my usual components resellers again, and discovered that Farnell (farnell.com) now carries the Murata 76601/3, rebranded model of the C&D one. I added this to my “things to do” list. The receiving stage consists of the Cirrus Logic CS8416 (cirrus.com), a widely used chip, followed by the asynchronous sample rate converter (ASRC), which samples the input signal to 96kHz. You can choose between the AD1896 or the Texas Instruments SRC4192 as ASRC. 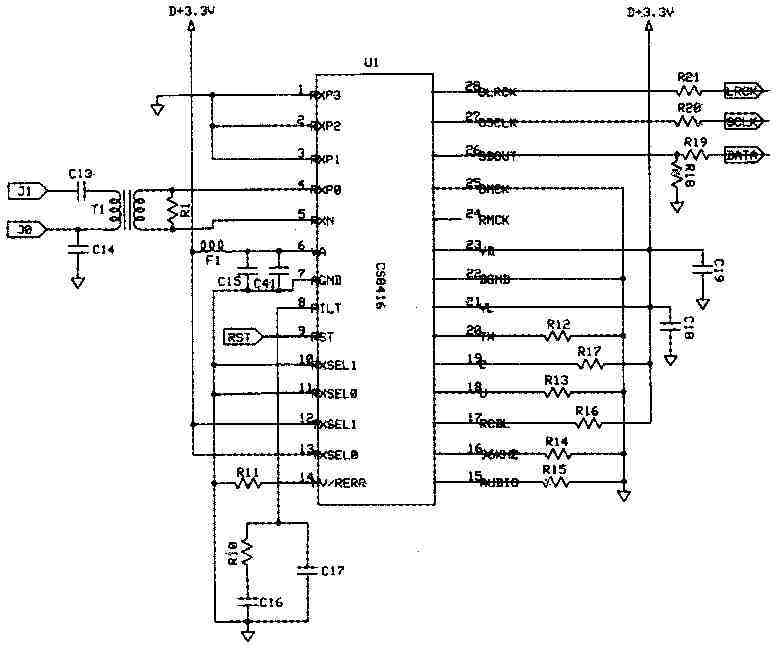 An external crystal oscillator generates the clock for the ASRC and the DAC, bypassing the CS8416 clock recovery. The conversion stage is performed by the Texas Instruments PCM1794 or the PCM1798, two of the best-sounding DAC chips on the market. The PCM1798 is cheaper, but it is a little bit noisier and outputs less current than its bigger brother. As I said before, the PCM1794/8 outputs current, so the needed I/V conversion is done using a simple resistor on each signal leg. The analog-output stage converts the differential signal, coming from the I/V stage, to unbalance and to amplify it. 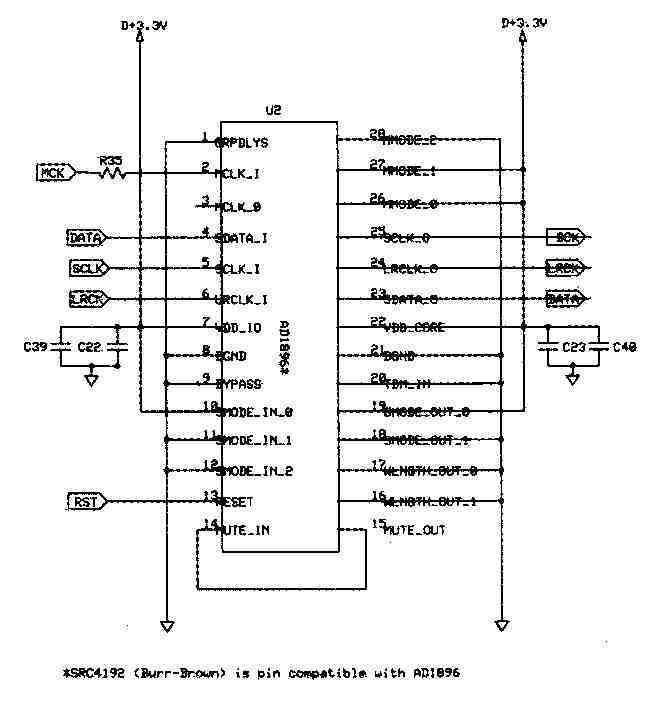 To do this job the AD8610 is used, but any other PIN-compatible integrated IC can be used, such as the National LME49710 (national.com) or the TI OPA134. A high-quality capacitor, placed on the signal path, applies a mild filtering. The basic configuration needs to connect an external filtered ±15V DC supply to the ezDAC, with the onboard regulators converting the voltage to 3.3, 5, ±12V DC. The second step—the one I utilize—is made by using a separate power supply to feed the digital and analog sections of the ezDAC, leaving the onboard regulators to do their jobs. The resulting improvement in the use of different transformers and filtering for the analog and digital supply is noticeable, so I highly recommend it. To make it possible, you need to cut a board trace as indicated by the black arrow in Photo 2. With the PCB version 1.5 you don’t need to cut anything, because a jumper is present for the purpose. The third possibility is to completely bypass the onboard regulators by providing a clean, low impedance source of regulated power: for example, you could employ Jung’s super regulator. As usual, the first components to be soldered are the smallest, in this case, the surface-mount ones, preferably starting from the center of the board. Using tweezers, a magnifying lens and some flux, and applying a small amount of solder on one of the two pads I first placed the SMD resistors and capacitors over the pads and heated the already soldered pad. Once done, I applied (with the tweezers) a small amount of pressure on the part and re-heated the pad to be sure that the component was flat against the PCB. Finally, I soldered the other side of the part. I checked the nearby traces with the ohmmeter to be sure everything was properly connected. The surface-mount chips are a step forward in difficulty, especially the PCM 1794 and the AD 1896 that have a SSOP package. I prefer to put a small amount of solder on two opposing corner pads, then place the IC over the pads and heat one of the pads with solder, adjusting the component so that it lines up with all the pads. Then I soldered the second pad applying some pressure so that the chip was flat and aligned. With this done, I soldered the remaining pads. I inspected the work—with a magnifying lens and the ohmmeter—to ensure there weren’t any unwanted shorts and for the proper pin-pad connection. This is the most time-consuming part of construction, but ensures an almost trouble-free first power-on of the DAC. I found it very helpful to utilize some flux (be sure to remove the residues because some kinds of flux are corrosive) and a solder with 2% of silver. For those who believe silver solder makes better-sounding devices, the real aim of the silver is to facilitate the soldering of SMT parts, because these components come with silver-plated leads. I used the Sn96.5/ Ag3.5 eutectic alloy. After finishing with the surface- mount parts, it’s time for the standard through-hole ones, starting with the resistors, followed by the capacitors, the quartz, and the pulse transformer, and ending with the four voltage regulators. You are free to choose the most exotic parts, if the dimensions and application are correct. 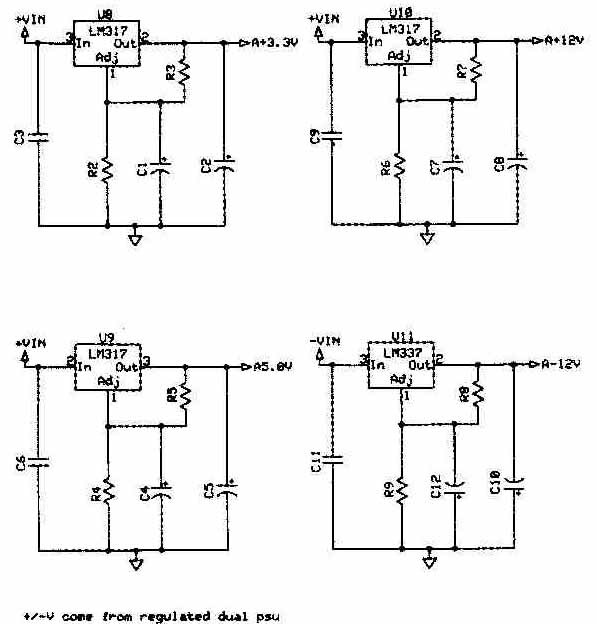 For example, I was careful with the ±12V DC regulators adjusting resistors (R6-7, R8-9) which I matched to get the same voltage output. For the adjustment pin bypass capacitors, I used low ESR (Equivalent Series Resistance) ones such as the Sanyo SH and the Panasonic FC, while the output caps (C2, C5, C8, C10) are generic with a significant ESR, because this resistance is used as a filter to prevent resonance. Finally, I preferred a polystyrene capacitor in the signal path (C33-36). 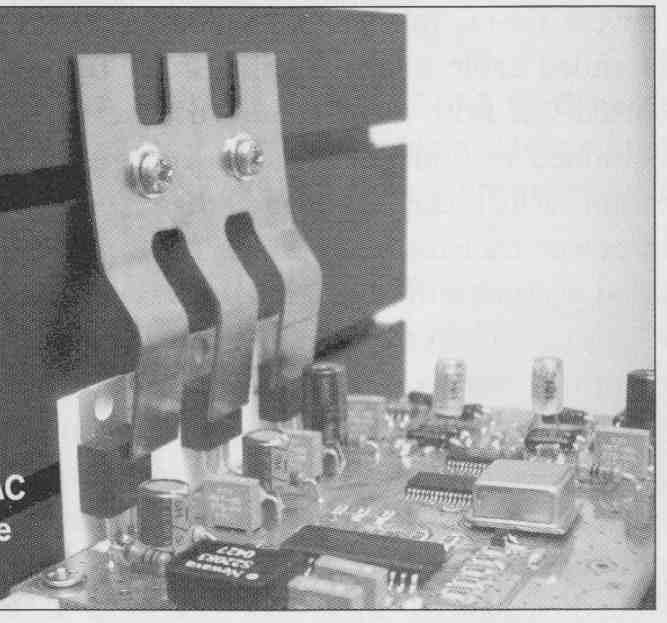 The finished ezDAC board is seen in Photo 2. 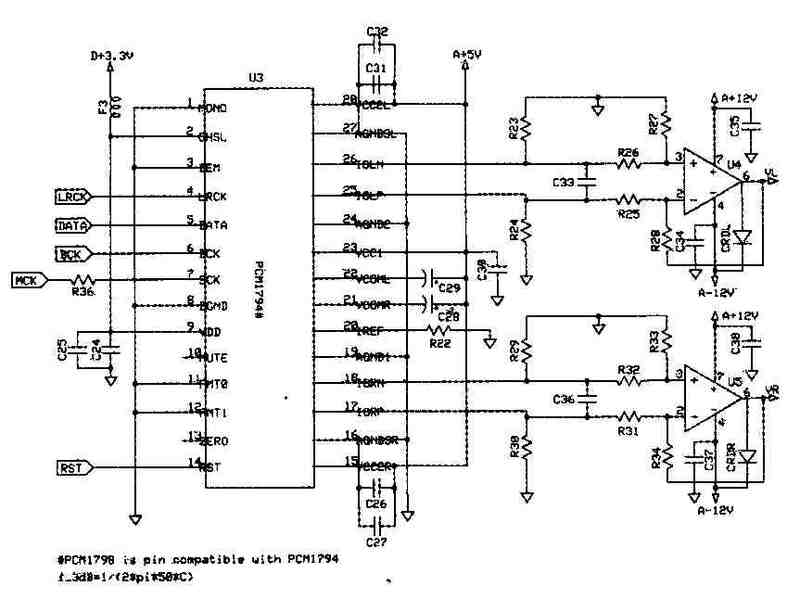 The schematic of the power supply I used is in Fig. 2. The 230V AC is filtered by a varistor, for surge suppression, and by an X2 class capacitor for RFI (Radio Frequency Interference). The MOV (metal oxide varistor) is a pretty useful component, because it protects the power supply from quick transient voltages by absorbing those dangerous pulses. It comes in a variety of clamping volt ages, with 275V AC the common value used in Europe, and 150V AC in the US. Its case is button style, ranging from 5 to 20mm diameter, with the bigger one capable of absorbing more energy. The main disadvantage of the MOV is that when it fails, due to a too long overvoltage, it doesn’t show up, leaving the user in doubt whether or not it is protecting. Moreover, in extreme situations, the varistor can ignite, as reported by the National Fire Protection Association, producing a dangerous situation. My suggestion is to use the Littlefuse TMOV, which integrates a thermally activated fuse, designed to open in case of overheating, thus preventing it from catching fire and failing. When the temperature goes down again, the TMOV reactivates itself. Littlefuse produces an even more advanced type, named iTMOV, which allows you to monitor the functionality of the varistor through an LED. Mouser (mouser.com), Digi-Key, and Farnell carry these Little fuse varistors. Two transformers are utilized to sup ply the analog and digital section; when choosing the secondary output keep in mind that the LM3x7 regulators need an input voltage at least 2V DC higher than the desired output to work properly. I placed a film capacitor between the transformer secondary and the bridge rectifier, which reduces the voltage transient due to the diodes switching. Each bridge diode is bypassed by a ceramic cap (X7R type), whose function is to minimize diode noise. PHOTO 2: The ezDAC completed PCB; the arrow indicates the cut trace to separate the analog/digital supply. 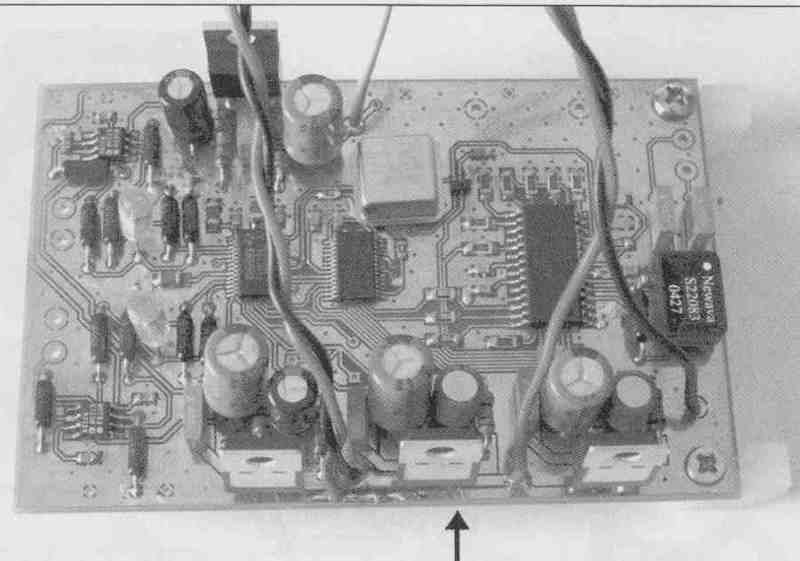 FIGURE 2: The PSU schematic. The filtering section is made by paralleling three 2200uF electrolytic capacitors, or 6600uF per rail. Using multiple caps instead of a single one helps to re duce the total ESR. The resistors R1-2-3 form an RC circuit to further improve the filtering capabilities of the power supply (I used two resistors in parallel because I already had them). 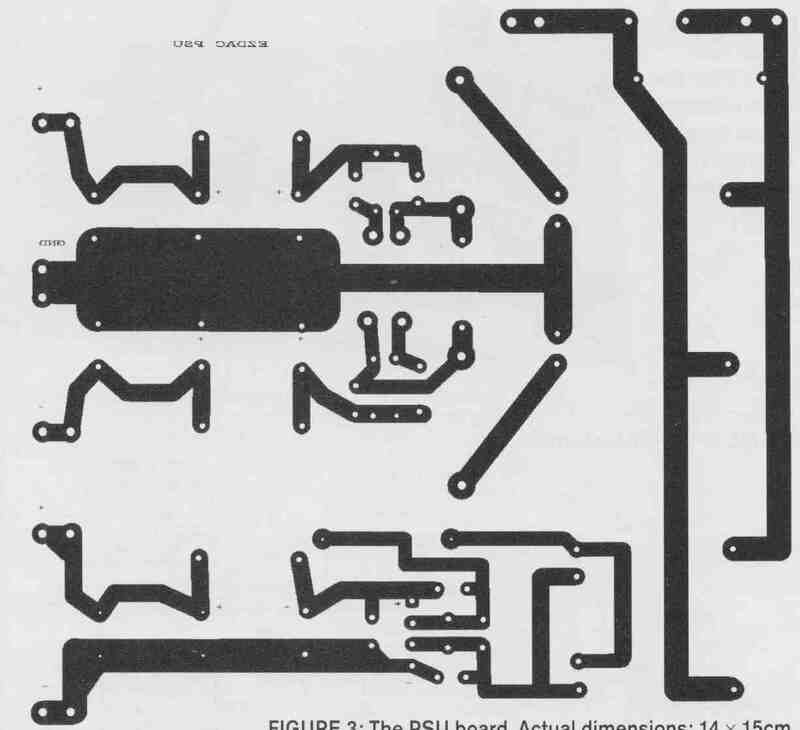 The PCB copper side is depicted in Fig. 3, while the completed supply is illustrated in Photo 3.The used components are listed in Table 1: the parts suppliers are Farnell (farnell.com) and RS-Components (rs-components.com). The case is the GX287 by HIFI-2000 (hifi2000.it), an Italian producer that sells abroad, too. The model I used has aluminum sides that can be used to dissipate the regulator heat. Using the inner cave and some screws, I blocked a clip that pushes the three LM317s to the case side, through an aluminum oxide insulator (Fischer Elektronik A0S247), which I preferred in order to get some distance between the PCB and the panel. The dissipation capacity of the case is overkill, with the 3.3V DC regulator (the one that has the hardest job) always cool after many hours of use. Photo 4 shows the DAC blocked to the case. I then took care of the power supply. Because there are some rails that carry the line voltage, I painted the PCB with transparent paint to achieve some electric isolation. Moreover, I glued a white plastic sheet to the case bottom. I found both the plastic sheet and the screw clip (used to block the regulators) in an old computer PSU, which I cannibalized for useful components. Once both the PCBs were fixed to the case, I connected the power cables first and the signal cable after. For S/PDIF cable I utilized the coaxial RG179, which has an impedance of 75-ohm as required by the Sony Philips Digital Interconnect Format. FIG. 3: The PSU board. Actual dimensions: 14 x 15cm. 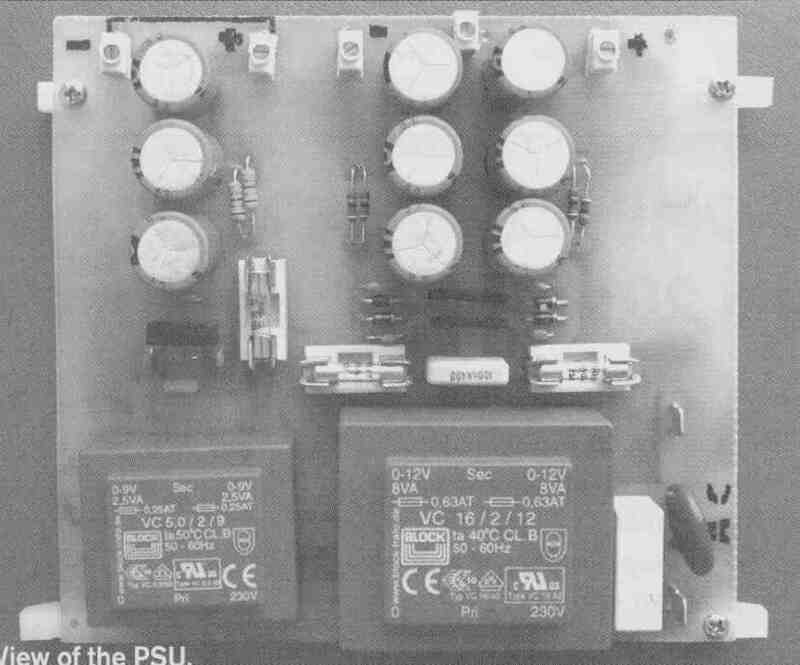 PHOTO 3: Vide of the PSU. 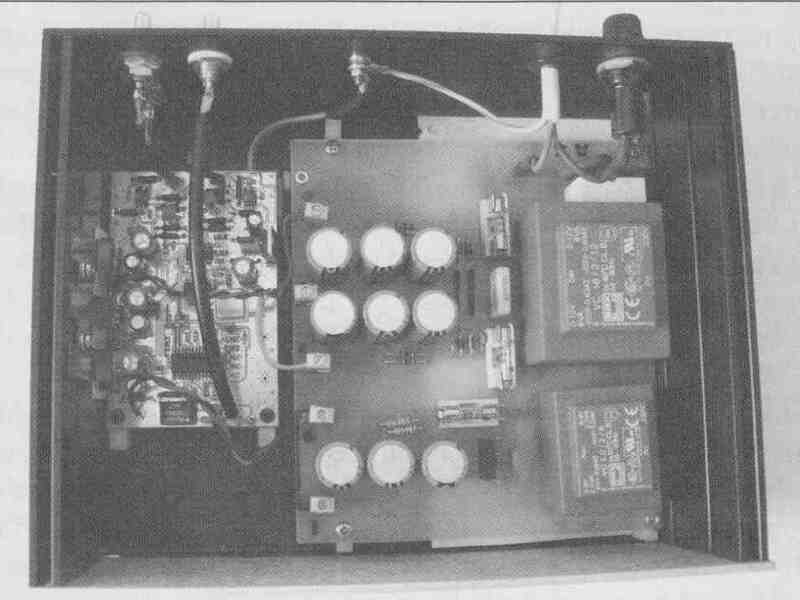 The completed DAC and its back panel are shown in Photos 5-6. Note that I didn’t use any power switch, nor an IEC power connector, but feel free to install them if you like. 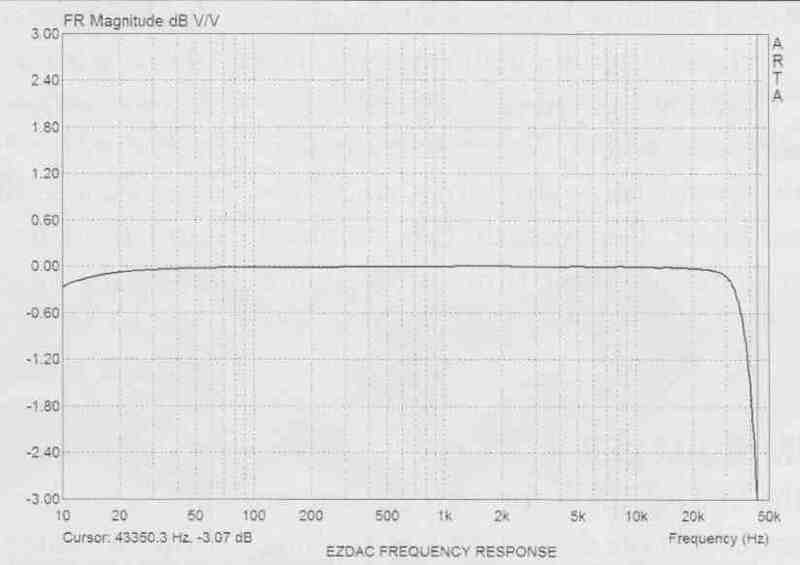 FIGURE 4: The DAC frequency response. 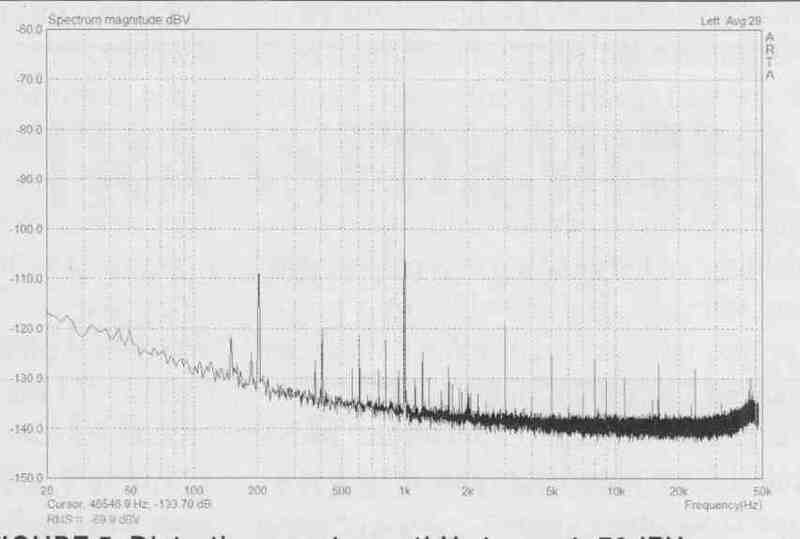 FIGURE 5: Distortion spectrum: 1kHz tone, at -70dBV. PHOTO 5: lop view of the finished DAC. PHOTO 6: Back panel view. 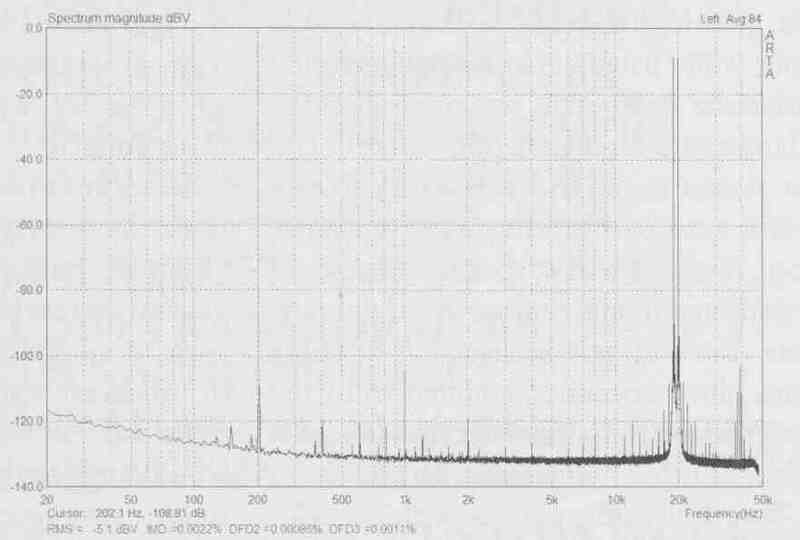 FIGURE 6: Intermodulation spectrum: 19 + 20kHz tones, at -5dBV. 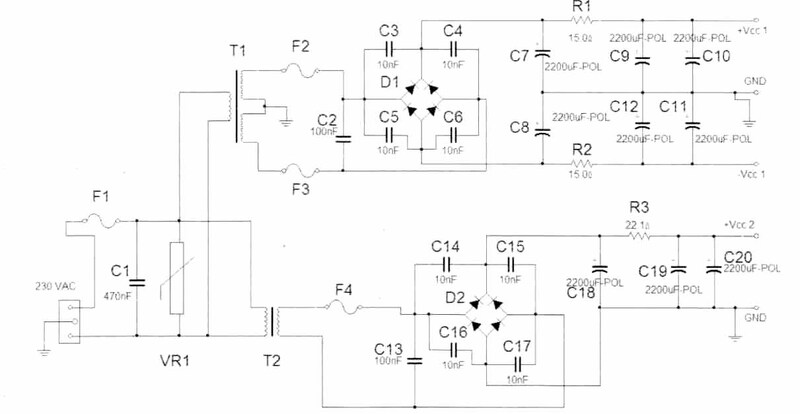 The output DC offset is 2 and 5.5mV for the right and left channel, respectively. The frequency response is rep resented in Fig. 4, showing an almost perfectly flat line in the audio band, with the -3dB frequency located over 40kHz. The channel matching was 0.06dB. Figure 5 is the spectrum distribution of a 1kHz tone. The harmonics are mainly of the odd type, but of very low value (the third harmonic is at about -120dB). The 200Hz tone, and its harmonics, belongs to the measurement chain, and is present in all the shown spectrums. The intermodulation spectrum is what you can see in Fig. 6, relative to a 19 + 20kHz tone. The resulting IMD is very low, with the tones products staying at an insignificant -102dB or lower. I am happy with the results obtained by this little DAC, which sounds pretty good. I compared the ezDAC to a cheap DVD player and medium-priced CD player, and the audible differences were like night and day, in favor of my last project. The total cost was about 140 euro, which sounds good to me in this time of world economy potential recess.